The USA Pavilion held its official ‘send-off’ to Expo 2017 Astana, Kazakhstan at an event in Washington, D.C., featuring U.S. and Kazakhstani representatives previewing the world’s most prominent energy, innovation and person-to-person global event of 2017. The project is a public private partnership, led by USAP Expo 2017, the nonprofit organization selected by the U.S. Department of State to design, build, and operate the USA Pavilion at Astana Expo 2017. The USA Pavilion showcases America’s leadership in technology and innovation, and highlights the strong partnership between the people and countries of Kazakhstan and the United States. 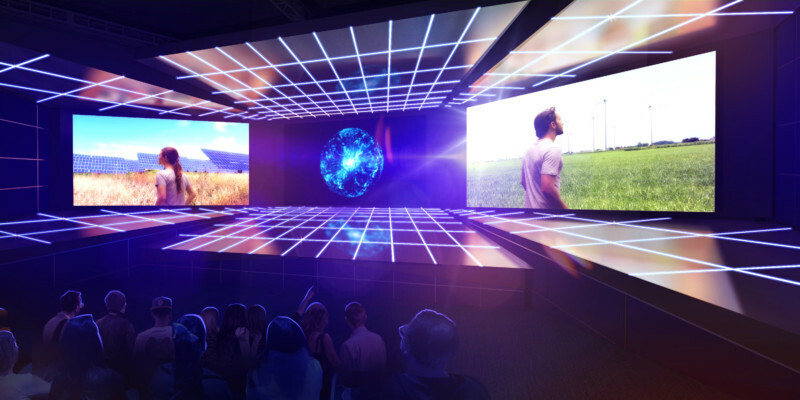 Visitors are greeted by a question at the heart of the Pavilion Experience: “What is the Source of Infinite Energy?” As they enter, they are surrounded by images of the United States and greeted by an American Student Ambassador. Following is a film that features America’s spirit of innovation that draws inspiration from the past while highlighting cutting-edge technologies of tomorrow. Afterward the guests are invited into the Energy of Life Theatre experience. Here visitors experience a surprising, delightful and entertaining show that is an emotional expression of the USA Pavilion theme: “The Source of Infinite Energy.” The show is displayed across three massive synchronized screens that are further enhanced by a multi-layered floor to ceiling audio and light spectacle. The Post Show answers the question in Theatre 1: “WE are the Source of Infinite Energy.” Here our sponsors and partners invite visitors to learn how the United States and Kazakhstan continue to expand upon their successful friendship and how we will continue to work to bring positive solutions to the world. Complementing these multimedia presentations, the Student Ambassador program, facilitated by the Eurasia Foundation, is a foundational component of the USA Pavilion experience. These forty young Americans greet and guide visitors through the Pavilion experience, providing guests first-hand interactions with the next generation of American innovators and leaders. The USA Pavilion Student Ambassadors, comprised of college and graduate students, represent 29 states, speak Russian or Kazakh, in addition to 17 other languages, and currently are studying subjects from energy and economics to business and diplomacy. The USA Pavilion is a public-private partnership and funded exclusively through donations. Corporate sponsors include: Chevron, GE, AES, Citi, ExxonMobil, Fluor, Mastercard, Coca-Cola, Cisco, Microsoft, Visa, and WR Grace.